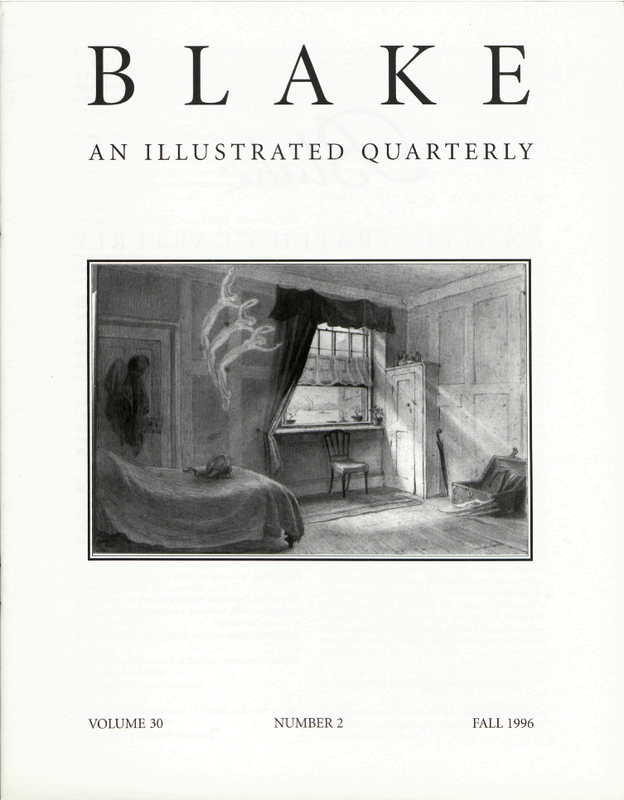 G. E. Bentley, Jr., is writing a biography of William Blake. Please note that as he is now retired after teaching for 36 years at the University of Toronto, letters should be addressed to 246 MacPherson Avenue, Toronto, Ontario M4V 1A2 Canada. Robert N. Essick has been publishing in this journal since 1969. Morton D. Paley is co-editor of Blake. His Coleridge’s Later Poetry was published by Oxford University in 1996. He is currently writing Apocalypic and Millennium in English Romantic Poetry. Lane Robson, MD, FRCP (Canada), FRCP (Glasgow), FRSH, FAAP, is a clinical associate professor of pediatrics at the University of South Carolina and an adjunct professor of Engineering and Science at Clemson University. Dr. Robson is currently researching the use of metaphors of sight in the works of William Blake. Sheila A. Spector is currently in the process of completing a monograph, The Development of Blake’s Language. Michael J. Tolley, Associate Professor of English at the University of Adelaide, finds that it gets harder to find room for Blake on a semester-based subject outline and waits for leave to get serious research done.